Quiz: Foods in Season, How Much Do You Know? Home > Food Types > Quiz: Foods in Season, How Much Do You Know? The best way to get hold of seasonal produce at its very best is to get to know your local supplier. Regularly shopping at a local greengrocer will let you know what is available when, what is grown locally and what is at its freshest and of highest quality. Weather conditions can alter the timing of produce; and areas where it is warmer than average compared to the rest of the country may be ready to harvest a month or so earlier in the year. Fortunately for us, a large number of fruits and vegetables are available across several seasons in this country. Some arrive on our shelves at the end of winter and last right through until early summer; while others are around for only for a couple of months or even weeks. So how well do you know when local fruits and vegetables are in season? Test your knowledge in our quiz and check your answers at the bottom of the page. 1. These two vegetables are available all year round. They belong to the same family and are staples of the British diet. 2. Spring is when this tender vegetable is in season. Distinctive in flavour, it is often eaten as an appetiser. 3. For the short weeks when these vegetables are in season in summer, they are unsurpassed for fresh flavour. Otherwise they are best bought frozen throughout the year. 4. A real kitchen essential that is available from cold storage all year, this flavourful vegetable is freshly harvested only from late summer until late autumn. 5. In season in autumn and winter, these berries, related to bilberries and blueberries have a sharper flavour. They are always eaten cooked. 6. At their best in spring, the main harvest of these root vegetables is at the end of summer or early autumn. Eaten raw or cooked, they are a nutritious addition to our diet. 7. Prized wild varieties of this vegetable are in season in autumn and their short season can be extended by drying and storing them. Cultivated varieties are available year round. 8. In season in spring and summer, this popular herb is delicious teamed with spring new potatoes. 9. These four salad vegetables and greens are now available all year round. 10. In season in summer and autumn, this root vegetable is available from cold store in winter. Wonderfully versatile it makes an attractive addition to a variety of dishes from soups to salads. 11. The tender young leaves of this vegetable are a welcome sight in spring when it is at its best, although it is available for most of the year. Versatile and nutritious it can be used raw or cooked. 12. As one of the first seasonal fruits to reach the markets in early spring, its season lasts until the beginning of summer. Cultivated versions arrive in the shops at the end of winter. 13. Great summer vegetables, lasting into autumn, the different varieties of these are versatile and also easily grown. 14. You can make the most of this fruit's short summer season by eating the sweet varieties raw, and using the sour varieties for cooking and preserving. 15. Though available year-round in supermarkets, these fragrant fruits are really in season in summer and early autumn. They grow on trailing vines and come in many varieties. 16. The closing days of summer and the start of autumn mark the short season for these fresh, exotic fruits. They can have green, amber or purplish-black skins and when eaten raw are best left on a sunny windowsill for an hour before serving. 17. 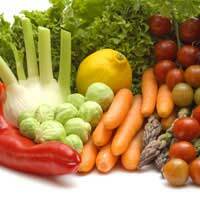 Invaluable cold weather vegetables, their season is from late autumn through winter into spring. Their tangy flavour complements a multitude of dishes and they are also delicious served on their own. 18. Although available dried at any time of year, this vegetable in its fresh and wild forms is one of the delights of spring. Used in almost every cuisine in the world, it has a distinctive aroma and flavour. 19. Another popular root vegetable, its season is autumn and winter. Used in hearty dishes, it can be cooked on its own or together with other root staples. 20. Harvested in late summer and autumn, these fragrant fruits are available from cold storage well into spring. Some varieties have soft white flesh while others have a soft, almost grainy texture. They are particularly good combined with cheeses. 1 - Cabbage and cauliflower; 2 - asparagus; 3 - peas; 4 - onions; 5 - cranberries; 6 - carrots; 7 - mushrooms; 8 - chives; 9 - rocket, watercress, curly endive and spring onions; 10 - beetroot; 11 - spinach; 12 - rhubarb; 13 - runner beans and broad beans; 14 - cherries; 15 - melons; 16 - figs; 17 - leeks; 18 - garlic; 19 - parsnips; 20 - pears. You will see from these answers that we have an amazing variety of wonderful foods grown right here in the UK all year round. Whether you want to do your bit for the environment by eating food that has not chalked up thousands of air miles, or whether you just have a taste for good food at its freshest and best, you will find the answers right here on your doorstep.